The American Filtration & Separation Society (AFS) recently named Cummins Filtration the winner of the 2015 New Product of the Year Award at their Spring conference in Houston, TX over May 9-11. 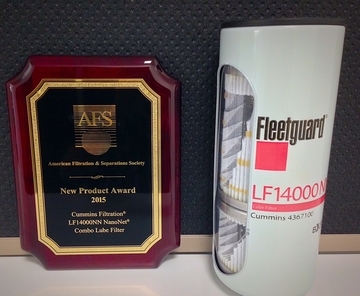 The Cummins Filtration LF14000NN lube filter was recognized by the AFS as the most significant new product introduction in the previous year as it became the company’s first lube filter with NanoNet® media, a patented polymeric nanotechnology-based media originally developed for Fleetguard fuel filter applications. “Engine design improvements now place higher demands on the engine’s filtration systems, challenging filter manufacturers to increase fuel economy while also maintaining superior particulate removal efficiency and capacity,” said Roma Fatima, Lube Product Line Manager, Cummins Filtration. “To meet these challenges, we adapted our proprietary polymeric media for lube filtration applications. The LF14000NN represents the balanced design that is possible with the use of our nanofiber media.” The new combination lube filter provides balanced filtration in terms of efficiency, capacity and restriction. Inside, the NanoNet media structure allows for finer efficiency of wear-causing contaminant particles as well as higher capacity to hold real world contamination throughout the filter’s desired service interval. A notable benefit of the low flow restriction capability is that the engine is able to operate more efficiently due to less parasitic power loss to the engine, which can lead to measureable fuel economy improvements.